Until I get to the bottom and I see you again"
So begins the Beatles song Helter Skelter, inspired by the Victorian ride. These rides were very popular at seaside towns in Victorian times. This one currently tucked away on Southbank for the summer wasn't the hit it might once have been. 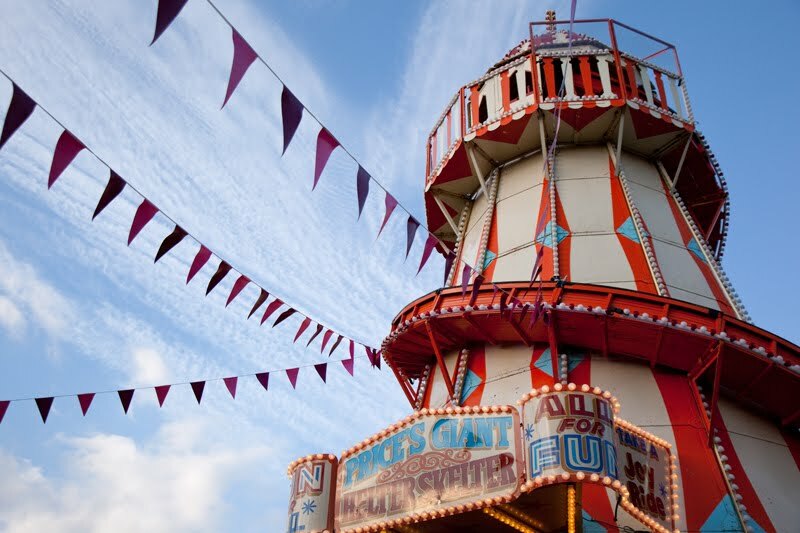 I used to love the helter-skelter when I was little. I think I have all Beatles album on my mp3 hard drive so I think it's time to have a listen. Love that Beatles song and this image reminds me of Blackpool. This takes me back, so many years have passed since I last was riding one, great fun. What a fun and wonderful picture Mo! I'm having fun just looking at it!!! This is an excellent capture MO. and framed nicely. Really like it. Great photo. Love how the shape of the clouds match the bunting. If you enlarge that shot it shows how well that shot was taken. Beautiful shot, brilliantly composed. Nice one!